Having a rich history of academic excellence, Canada has long been a smart choice to pursue your higher education abroad. Especially if you are an interactive person, you can benefit from the multicultural society the country represents. Language is not a barrier to foreign students as Canada is considered the world’s leader in language training. Canada provides a peaceful, safe and diverse environment to students, as well as an excellent working condition and a conducive atmosphere. Canada is a North American country, located in the northern part of the continent, and extends from the Atlantic to the Pacific and northward into the Arctic Ocean. It consists of ten provinces and three territories. The country Canada is rich of tourist attractions, such as the magnificent Niagara Falls, the grand CN Tower, Toronto Zoo, the alluring Glacier National Park, the equally gorgeous Banff National Park, and the beautiful Canadian Rockies, to name a few. Having two official languages – French and English, study in Canada is the perfect opportunity to add another language skill to your resume, which is vital in the business world and at the same time a huge advantage. In terms of tuition fees and living costs, studying in Canada is a suitable option for most of the students willing to study abroad. Estimated living expenses per month are around CAN $400- 800, but obviously you can live on less or more than that, depending on the way you choose to spend your time. As far as course fees are concerned, expect to budge around CAN $6000 to CAN $17,500 per year for undergraduate courses, with graduate courses coming in on average from CAN $6500 to CAN $33,000 per year. 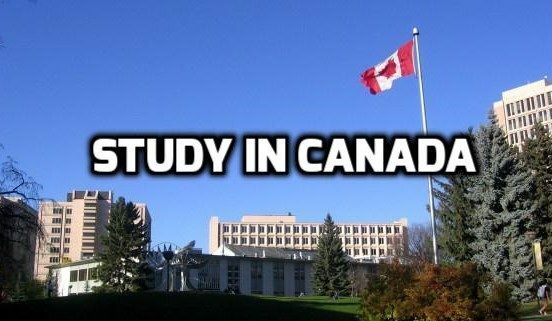 Being an ideal place for higher education studies, Canada has been sought by many prospective international students. Many of the Canadian universities have been reputed well in the international rankings. Moreover, a recent educational strategy set by the Canadian Ministry of Education stresses on increasing the number of foreign students, thus enhancing chances for students to study in Canada. Over 120,000 international students are admitted in Canada each year. It makes it one of the most ethnically and linguistically diverse countries in the world, with over 50% of the population not speaking English as their first language. This means that throughout Canada you will be surrounded by a large multicultural environment, both in classrooms, as well as in the society. This allows any foreigner to easily adapt and make friends here. Canada has been ranked as one of the safest countries in the world, with a low crime rate. Canada was ranked the second country in the world with the highest quality of life in terms of social progress and development, according to Global News. Most of the study programmes delivered by Canadian universities are research focused and students get the chance to engage in intriguing experiments and projects. This research based environment promotes study based on innovation and forward thinking. It is expected that international students should start planning for their studies in Canada 1 year in advance. The major intake takes place in fall i.e. September, while the other intake is in winters i.e. January, but it also depends on the study program and the institutes the student is applying to. A few institutes may have the May intake as well. Deciding a university is the first and foremost step while applying for studies abroad. Course selection is entirely based on your previous qualification and your area of interest. Once decided, you will be provided an acceptance letter from the Canadian university, which you need to provide while applying the study visa. The university system of Canada is considered quite successful because it provides career-focused programmes; curriculum adapted to current events and prepares you according to the needs of the job market. Moreover, graduates from Canadian universities have a high employability rate. It has to be considered that an application for international study to Canada can be a slow process, taking up to 7 weeks of processing time. Keeping this in mind, you need to be making a timely decision to get all the documentation done prior to your academic calendar. A student visa, or study permit is required, which is granted on the base of the acceptance letter from your chosen Canadian education institution. Secondly, you’ll also need your application fee, financial evidence to cover your expenses during your studies, such as to pay for tuition fees and cover day to day living costs, as well as a ticket home. You enrolled in a programme that lasts less than six months. However, in this case an Electronic Travel Authorization (eTA) will suffice to fly to Canada. After receiving the acceptance letter from the university, it is time to proceed and apply for a student visa with no delay. Submit medical certificates that state you are in good health, and complete medical examinations in some cases. Note that the study permit expires ninety days after your studies are complete, and when you receive a notification of the programme completion. If you are applying from Pakistan, you might have to get your biometrics taken at a Visa Application Centre in your country. The biometric fee is 85 CAD. It is additional to the regular visa fee. Some countries are exempt from the biometrics requirement, i.e. they won’t need to visit an application centre at all. Depending on your individual situation you might also be called for an interview, for which a small amount of fee will be charged by the local visa application centers for using their services. We at Immigration Experts streamline and personalize the study visa process for each student, irrespective of the destination, institution, course or any level of study. Our team of experienced professionals will provide you individual assistance, and exceptional guidance in the process of filing your application, course selections, admission, visa, bank-loan and scholarships. Start your education overseas with valuable information provided by Immigration Experts on everything you need to know about studying abroad from study permits, temporary resident visas and the costs involved. Send us your details at studentvisa@immigrationexperts.pk to choose your university under the guidance of our experts, and ensure that you have all your paperwork in order without any inconvenience. By opting to study abroad, you can really begin to look forward to not only moving to a beautiful and vibrant country, but also to experience a life like no other.